Mexican Chocolate Popcorn and Almonds - Home. Made. Interest. 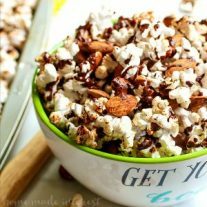 This sweet and crunchy Mexican Chocolate Popcorn and Almonds is a light and satisfying snack that is easy to make. Hey guys! Did you know that February 16th is Almond Day? And that the whole month of February is American Heart Month and National Snacking Month? It’s the trifecta! I’m ready to celebrate because every day is almond day in my house. It’s one of the good-for-you snack choices that my guy and I both agree on. I talk a lot about eating low carb and all of the delicious low carb recipes that go with it but what I haven’t told you is that I live in a house divided. While giving up bread, pasta, and sweets works for me, my guy just can’t do it. He has really, really tried but he just can’t give up on carbs. Almonds are one of the snacks we both get to enjoy whether it is a handful of roasted, flavored almonds for me or sweet and crunchy Mexican Chocolate Popcorn and Almonds for him. Almonds are full of all sorts of good stuff. Just one ounce of almonds provides 4 grams of fiber, 6 grams of protein, and 13 grams of “good”, unsaturated fat! That helps you feel satisfied and energized during the day. They’re also an excellent source of antioxidants, vitamin E and magnesium. Almonds are extremely versatile. I love them plain but since I eat them as a low carb snack A LOT I like to add some flavor to them by toasting them with different spices. My guy can take those same toasted almonds and add them to a bowl of popcorn with a little Mexican chocolate drizzled over them and he’s got a light snack that satisfies his craving for sweets. 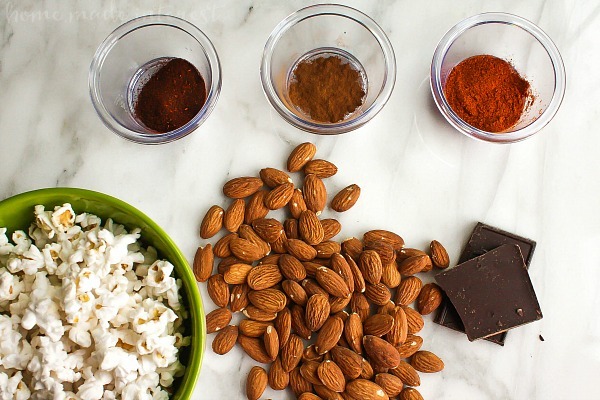 The recipe for Mexican Chocolate Popcorn and Almonds is super easy. You start by lightly tossing almonds in olive oil, then sprinkling them with a mixture of cinnamon, chili powder, and cayenne. Then you spread them out on a baking sheet and toast them in a 350 degree F oven for 10 minutes, stirring twice as they cook. When they come out of the oven they smell amazing and I’ve got a perfect, flavorful low carb snack. For my guy I go one step further (I’m so nice! ;). I pop some popcorn for him (un-buttered because we still want this to be a light snack), toss it with just a little olive oil and sprinkle it with the same spices. 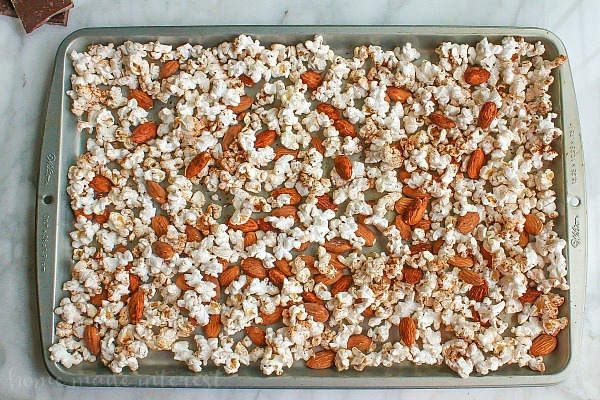 The popcorn and almonds get mixed together and spread out on a baking sheet to make a single layer. We love spices that give food a little kick but I know my guy and if there is a way to add chocolate to something he’s all for it. So, for this recipe I made a Mexican chocolate drizzle that gives it that sweet and spicy flavor you find in Mexican chocolate cake or Mexican hot chocolate. I used some of the same spices that I sprinkled on the popcorn and almonds, a little cinnamon, a little cayenne, and added them to some melted dark chocolate (the darker the better I used 70% dark chocolate). Then I drizzled the chocolate over the popcorn and almonds and let it harden before breaking everything apart and serving it up. It’s a great sweet and spicy snack with a little crunch. It’s light but the addition of the almonds makes it satisfying and if you’re like me and want to skip the popcorn no worries, just bag up the almonds and when you need a snack grab a handful and munch away. New research shows that a healthy handful of whole or chopped almonds provides up to 25% fewer calories than previously thought, compared to the number of calories listed on nutrition labels. So either way it’s a light and delicious snack! 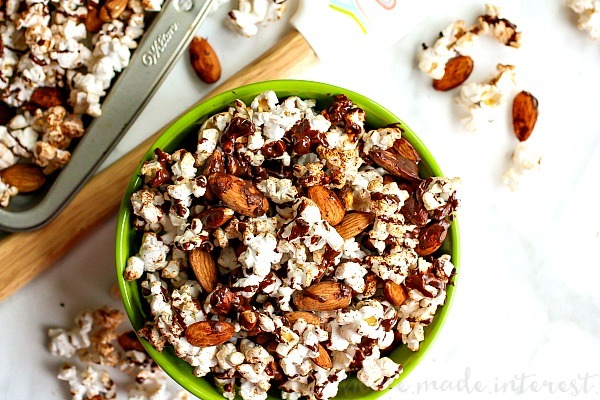 This sweet and crunchy Mexican Chocolate Popcorn and Almonds is a healthy snack that is easy to make. 1/2 teaspoon Kosher Salt, If the popcorn is unsalted. If it has salt already skip this ingredient! In a medium bowl toss the almonds and 1 tablespoon of olive oil together. In a small bowl combine chili powder, kosher salt, cinnamon, and cayenne pepper. Sprinkle the spice mix over the almonds and then spread them out on a baking sheet and bake them for 10 minutes, stirring twice as they bake. Pop popcorn according to package instructions. In a large bowl add the olive oil swirling it around the bowl to spread it out. Add the popcorn to the bowl and gently toss coating the popcorn lightly in oil. Sprinkle the spices over the popcorn as you toss it to lightly coat the popcorn in spices. Melt the dark chocolate in the microwave stirring every 15 seconds until it is smooth. Add the cinnamon and cayenne and stir until fully incorporated. Combine the almonds and popcorn together and spread the mixture out on a baking sheet making one layer. 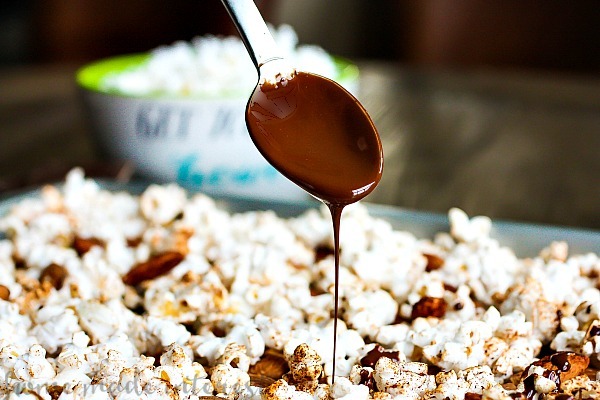 Drizzle the melted chocolate over the popcorn and almonds and then let it sit until the chocolate has firmed up.